In 1878, Margaret Wolfe Hungerford famously coined the expression “beauty is in the eye of the beholder.” It is found in her book titled “Molly Bawn.” It tells us that what is beautiful to one may be unremarkable, or even ugly to another. Like most such sayings, there is undeniable truth in it, albeit with limitations. A newborn baby looking up with trusting eyes is always beautiful. Bigotry and discrimination borne from ignorance are always ugly. The garden, landscape, and yard that we prepare are, we hope, beautiful to as many people as possible. While no two gardeners choose the exact same presentation, timeless beauty is our goal and purpose as we prepare our outdoor environment. Gildshire Magazines sought out the current and coming trends in the realm of garden, landscape, and yard features. Here is what we found. All green, all the time: “Green is the Colour” is a track on Pink Floyd’s 1969 Soundtrack from the Film More, and it describes the first trend on our list. This all-green beauty is an example of the new monochrome look in garden, landscape and yard. More landscape designers than ever are using variations on the theme of “green” to transform their space into a beautiful one. For years, “green” has been a watchword for a yard that is sustainable from an ecological standpoint, and no one is stepping away from sustainable and environmentally sound. Now, though, various shades of green are a thematic trend. The effect, rather than being boring, is a fascinating study in shading and the texture of the color green. Pink Floyd never had this in mind, but they could have been the inspiration for it. Get ready for “hygge”: It is a word you are going to hear a lot in the coming years. Pronounced “hew-guh” it is Danish for coziness through simplicity. The move toward hygge has edged us toward a hybridization of the indoors and the outdoors. Cozy and intimate outdoor seating arrangements foster conversation. Water features and subtle lighting accent the landscape and draws us into our surroundings. At the same time, hygge encourages comfortable movement. Meandering pebble-strewn paths and casual stone walkways bring about walking and talking, something lost in translation with today’s digital-centric world. Planting for pollination isn’t just a trend. It’s a necessity: It has been said that we are living in “Beemageddon.” The loss of pollinators, such as honeybees, hummingbirds, and butterflies is an alarming trend. The modern garden, landscape and yard artist is aware of the carnage brought about by the loss of habitat and the indiscriminate use of pesticides. Hopefully not too late, we are beginning to do something about it. Homeowners are developing gardens that attract pollinators. Native plants are placed in gardens to provide sources of nectar. 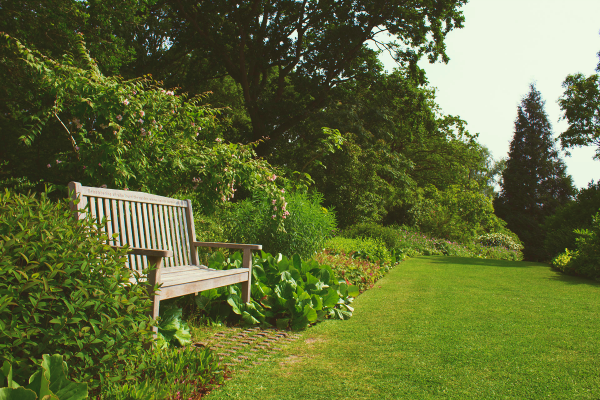 Eco-friendly materials and pollinator gardens are a reflection of an aware homeowners’ interest in sustainable landscapes. More information on this subject can be found on The Butterfly Site. Look up and notice the gardens above: That may sound more spiritual than we intended. Actually, we meant it literally. In urban settings, the tops of buildings are becoming garden, landscape, and yard sites. It is a trend that started in Japan but is all over the place in Europe. Now, rooftop garden spots are becoming commonplace in the United States, as well. It is a good thing, too. Cities covered with cement are a leading cause of climate change. A rooftop garden cools the immediate area by as many as seven degrees. Multiply that by a couple of hundred buildings. We can make a difference. None too soon, at that. New trends are exciting to uncover, whether in fashion, automobiles, or landscaping. We love to find what is new, while we celebrate the tried and true. It all combines to make lasting memories of beauty…at least as our eyes behold it. We knew you would agree.